Panasonic reveals 2017 4K and HD TV line-up | What Hi-Fi? 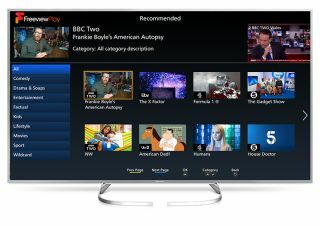 The range includes the 4K HDR compatible EX750, EX700 and EX600 - as well as two Full HD TVs, the ES500 and ES400. Panasonic has also updated its home screen interface for 4K and HLG playback. Panasonic has today announced a smorgasborg of LED TVs at a launch event in Frankfurt. The company's latest generation of LED products features "enhanced LED lighting and the latest LCD panels", as well as support for 4K and HDR pictures. HDR content can be played on these TVs through streaming services like Netflix, Amazon Prime and YouTube, as well as from Ultra HD Blu-rays. Hybrid Log-Gamma support will also be made available later this year. Panasonic's range is headed by its LED flagship, the EX750, which comes in four screen sizes (75-inch, 65-inch, 58-inch and 50-inch). It is followed by the EX700 and EX600, and two Full HD models - the ES500 and ES400. In terms of features, these televisions will have a Cinema Display mode, which Panasonic say uses "enhanced local dimming for inky blacks with subtle gradations, and outstanding levels of brightness". Panasonic's 2017 televisions also use the Studio Colour HCX2 processor, which apparently boosts picture quality using Digitally Enhanced Local Dimming of the LED backlight. Panasonic has updated its interface too, adding in a favourites folders for multiple users, a My App button on the remote that can be customised for faster access to selected content, and a revamped Media Player app that supports 4K HDR10 and HLG content playback.